Shake things up a bit with a delicious twist on traditional grilled cheese. Ready in less than 20 minutes, this Apple Gouda Grilled Cheese is sure to please. 1. Preheat table top grill or sandwich press coated with cooking spray. 1. In a small bowl, mix together honey and Dijon mustard. Evenly distribute and spread honey mixture onto one side of each slice of bread. 1. Top each slice of bread with one slice of Gouda cheese. Divide apple slices and place onto four slices of bread. 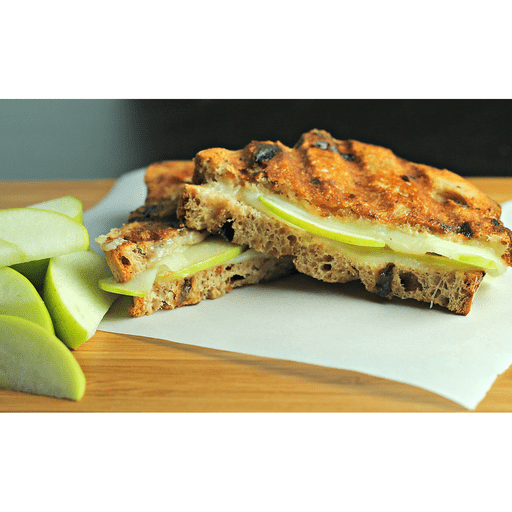 Top apples with remaining four slices of bread and cheese to complete sandwiches. 1. Place sandwiches onto grill or sandwich press and cook until cheese is melted, about 4-5 minutes. Serve warm. For gluten free: Use gluten free bread instead of whole wheat raisin bread. For dairy free: Use Gouda style cheese substitute instead of Gouda cheese and coconut oil instead of butter. Calories 360, Total Fat 12g (Saturated 7g, Trans 0g), Cholesterol 40mg, Sodium 580mg, Total Carbohydrate 50g (Dietary Fiber 5g, Sugars 31g), Protein 13g, Vitamin A 6%, Vitamin C 0%, Calcium 20%, Iron 10% *Nutritional values are an approximation. Actual nutritional values may vary due to preparation techniques, variations related to suppliers, regional and seasonal differences, or rounding.